Silver Sage Village residents attend a variety of events including a picnic at Heil Ranch. Join the facebook page for the movie. A new documentary about aging together finds 25 senior citizens the subjects of “Aging Gratefully: The Power of Community”. Keep up with the latest on the facebook page. The film provides insights from six residents of the Silver Sage Village senior cohousing community about their experiences of growing old together. Filmmaker Alan O’Hashi and videographer Michael Conti pose at the Little Yoga Studio where the opening sequences were filmed. Filmmaker and Silver Sage Village resident Alan O’Hashi was on his death bed in December 2013. While regaining his health he joined a yoga community to regain his strength. The opening scene was recorded at the Little Yoga Studio. Henry and Jean Kroll celebrate’s Henry’s birthday at Silver Sage Village. Jean was diagnosed with Alzheimer’s Disease and is now living in a long term nursing facility. Cohousing pioneer Chuck Durrett and gerontologist Anne Glass phD offer their perspectives about senior cohousing living. Here’s the best stage play gig in town – Hitching Post Theater. Looking for a great night of entertainment? Stop by the Nomad Theater in north Boulder on Sunday December 12. Here’s how it works. Five writers meet at the Kelly Barn at 830am and given a topic, grab a prop out of a box and randomly choose two actor head shots then have until 1230pm to write a short play. When the time limit is up, each writer hands the prop, head shots and script are handed over to a director who tracks down the two actors. They have until around 6pm to rehearse. The doors open at 630pm and the plays are performed that evening at 7pm and 830pm at the Nomad Theater on North Broadway. Jesse McDonald and Erin Kelly are the brains behind Rock Rose Entertainment. Sign up for the facebook page to keep up with the latest! 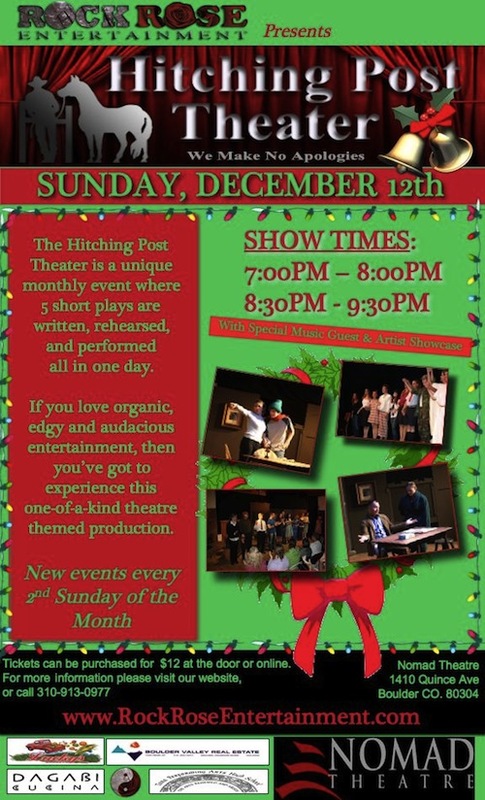 The Hitching Post Theater needs actors, directors and writers to push themselves to their limits once a month on the second Sunday. Auditions for future shows happen this Thursday Dec 2nd at the Kelly’s barn from 2:00-3:00. Please email info@rockroseentertainment.com for further information and directions. Boulder Community Media produced the Impact on Education Award Recipient program that aired on Boulder Valley Television Channel 22. The program filmed and edited by Alan O’Hashi and Michael Conti won the Colorado School Public Relations Association Electronic Media Award of Excellence in the Television category. Click on the CoSpra logo to watch the video trailer for the program that honors educators and staff in the Boulder Valley School District. The CineYouth Film Festival set for May 6 – 8 at Columbia College in Chicago has a new deadline for film entries. If you’re 20 years of age or younger, then this festival is for you. Officially selected films will be screened and filmmakers are invited to attend exciting workshops, meet film professionals and network with other youth filmmakers from across the country at the Festival in May..
For more information, please visit http://www.cinemachicago.org/cineyouth for submission guidelines and festival information. Columbia College is located at 1104 South Wabash in Chicago. BCM Business After Hours huge success! Boulder Community Media (BCM) was the site for the February Business After Hours networking event. Trattoria on Pearl provided great appetizers, pizza and pasta and music was provided by Caroline Cotter. Well over 125 people attended the mixer. Click on the image of Caroline Cotter to view other photos from the event taken by BCM paparazza Ejiga Hartmane and paparazzo Ken Wajda. The Boulder International Film Festival (BIFF) opened with a great start on Thursday night at the Boulder Theater. Boulder Community Media (BCM) covered the event that featured the movie “The Lightkeepers” directed by Dan Adams and produced by Straw Weisman. Blythe Danner, one of the actors in the movie, was on hand to watch the screening. Click on the photo to see more images from opening night. (BCM Photo: Jenna Jordan).